Fares are legally fixed and vary between the different colors, with the red cabs being the most expensive. The type of car that can be used as a taxi is also restricted by the government. Since Nissan discontinued the production of the Cedric Y31 in 1995, almost the only car in use is the Toyota Comfort. Built since 1995, it quickly became a classic on the streets of the SAR through its simple design. The models built prior to 2008 usually seat 5 passengers, but the newer cars only have room for four, as Toyota places the gear change on the floor next to the driver. There are about 18,000 taxis in Hong Kong, but new licenses have not been issued since 1998, so the only way to enter the business is to buy a licence (about 5million hk$). I believe this is problematic in many ways. 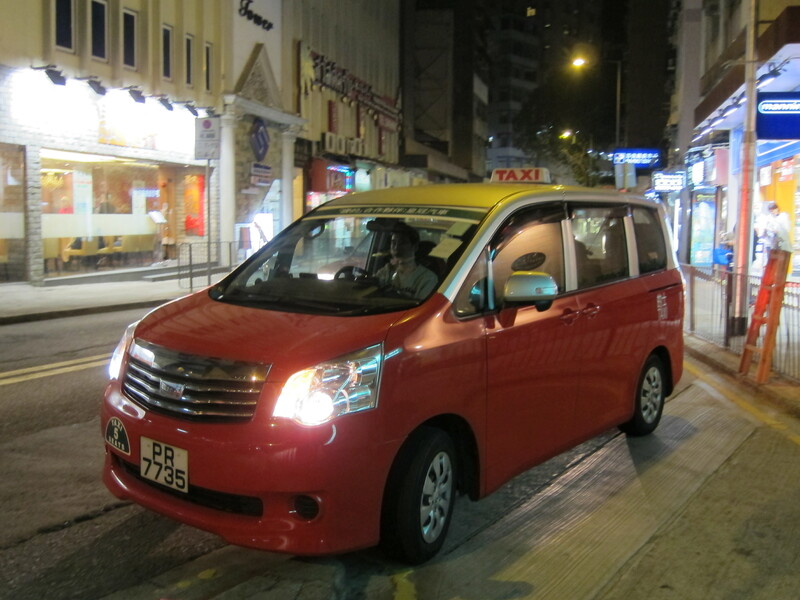 A Toyota Noah as a Taxi on Caine Road, Central. Vans are rarely seen as taxis in Hong Kong, but are at times permitted to meet demands from disabled citizens. In the short run this heavily favors incumbents, those who already had a licence prior to 1998. They do not face additional cost increases and can have a significantly higher income than their colleagues who started driving cabs later. When these older cab drivers want to retire, they on top of that are able to sell their licences, giving them a nice retirement fund. Though that seems like a benefit, it comes at the expense of those who start driving today. These cabbies have a lower income from the first day that they start, because they need to pay off the cost of the licence. If the licence is financed through a credit, the interest that needs to be served easily surpasses the annual wage. It is unlikely that cab drivers will be able to pay off their debt ever. They will need to use the revenue from selling the licence at the end of their career to cover their debt. They will not be able to pay into their retirement funds and all that they are left with is the uncertainty of the value of their licence. Not issuing new licences makes it difficult to enter the market. It is difficult for most taxi drivers to borrow the money needed to get a licence. As many drivers will not be able to acquire a licence, they will be left with working as employees for big companies. That makes them less independent and leaves them in a work environment in which they barely make minimum wage, as opposed to an environment in which they are their own boss. In the long run the administration’s policy will have one effect on society: Too few cabs. This can already be seen at certain peak times, when long queues form near MTR stations and hotels. As prices are fixed, the amount that the cab drivers receive in those times does not increase. If we however factor in the costs of queuing up, the passengers do pay a higher price. In addition, cab drivers during such times will favor certain routes over other. Though it is technically illegal for a taxi driver to refuse a passenger, it will become common practice for taxi companies to prefer their telephone bookings over customers from the street, and furthermore to only serve profitable routes. This will lead to frustration, as taxis become increasingly difficult to hail, and unreliable to book over the phone. Not issuing taxi licences, or rather, to arbitrarily restrict the number of taxis in Hong Kong, harms newcomers in the business and will in the long run severely disrupt the reliability and customer satisfaction of the Hong Kong taxis. It is furthermore a legislation that is very difficult to get rid off. As the price for licences has already climbed to insane heights, making such licences void would lead to the bankruptcy of those who indebted themselves to buy one. The quicker the government wants to tackle this problem, the more costly it would be for the taxi drivers. Giving out new licences tomorrow to anyone who meets certain criteria (a drivers licence and a test of the knowledge of the streets, for example) would solve some of the problems mentioned above and be a quick solution, but it also creates many new ones for those who bought expensive licences in the expectation of the status quo. Issuing new licences tomorrow through auctions would bring down prices slowlier, but it is difficult to anticipate exactly how. This entry was posted in Economics by Leonhard Weese. Bookmark the permalink.